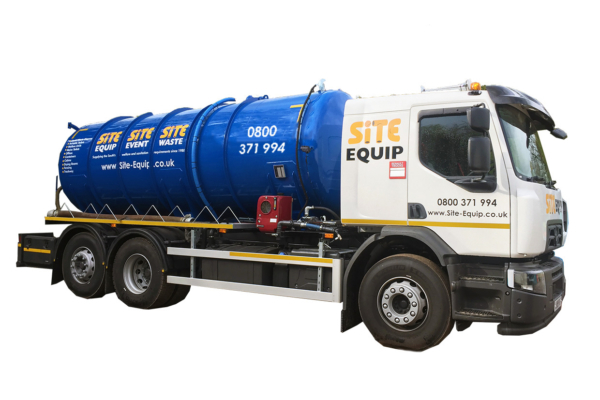 Site Waste provide a sewage waste disposal service to remove any sewage from your site using our fleet of tankers. Our tankers range from our HGV vehicles which can extract up to 4000 gallons, right down to our 4×4 Land Rovers which can take as little as 40 gallons, perfect for restricted sites. It is against the law to dump hazardous liquid waste, so to avoid receiving a fine, affecting your reputability and potentially polluting the environment, use our qualified service team for your sewage waste disposal as we are licensed to remove and discard liquid waste appropriately and legally. We also offer various other liquid waste disposal services, such as waste tank emptying, cesspit emptying, and portable toilet waste. Why order your Sewage Waste Disposal from Site Equip? Professional Service, our tanker servicing is the best in the UK, with our service operators completing their Level 1 National Sanitation Qualification and two winning service attendant of the year! With our two depots in Lasham, Hampshire and Paddock Wood, Kent, we have a large coverage spanning across South East of the UK, including Hampshire, Berkshire, Dorset, Essex, Kent, Wiltshire, London, Surrey, Sussex, Buckinghamshire & Oxfordshire. We can offer this service on a weekly or ad hoc removal basis. Please get in contact if you would like to find out more about our sewage waste disposal. You can call our friendly sales team on 0800 371994.